I am not excited about this post, but I feel it is appropriate for the time of year. First of all, go Broncos!!!!! Second of all, the New England Patriots beat the Seattle Seahawks on February 1st, 2014, in Super Bowl XLIX; the final score was 28 to 24. I was for the Seattle Seahawks because they are the lesser of two evils in my personal opinion. I ended up with no voice and disappointment. UGH!!! Super Bowl 50, Denver Broncos. I’ve said my peace. Moving on to stats. I am only listing the basics: Passing, receiving, & receiving. We all know who won so no need for fumbles, penalties, and records. Diehard fans can go to espn.com for the extra information. MVP – Tom Brady (#12): 50 attempts & 37 completed passes. 328 yards. 4 touchdowns & 2 interceptions. 1 sack. Russell Wilson (#3): 21 attempts & 12 completed passes. 247 yards. 2 touchdowns & 1 interception. 3 sacks. Julian Edelman (#11): 9 catches & 109 yards. 1 touchdown. Rob Gronkowski (#87): 6 catches & 68 yards. 1 touchdown. Chris Matthews (#13): 4 catches & 109 yards. 1 touchdown. Ricardo Lockette (#83): 3 catches & 39 yards. LeGarrette Blount (#29): 14 carries & 40 yards. Shane Vereen (#34): 4 carries & 13 yards. Marshawn Lynch (#24): 24 carries & 102 yards. Russell Wilson (#3): 3 carries & 39 yards. Time to address the halftime show. I thought Katy Perry sounded great and put on a great show. The song choices were appropriately matched to each stage set-up, and “Firework” was the chill-inducing finale I expected it to be. And now… the moment you’ve all been waiting for… THE COMMERCIALS!!! 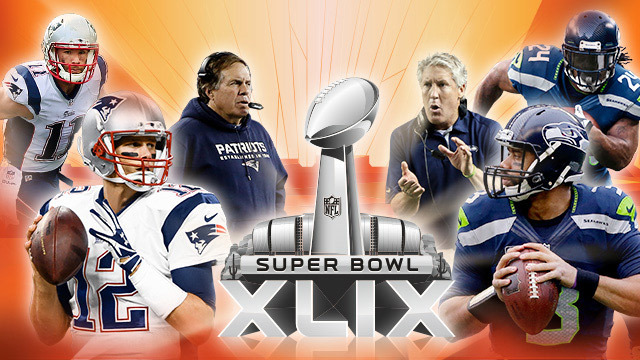 Because my team was not playing in the big game, I was not as interested therefore I missed most of the commercials. However, I saw enough of them to give you a list of my favorites and honorable mentions. Companies were really tugging at heartstrings this year. There were funny commercials, but the commercials that made the most impact were deep and emotional. Interesting.